Coach Darren Utterback, center, among finalists, from left: Drake Dvorak, Ayrton Garcia, Cole Paxson and Isaac Wulff. Utterback resigned as LBHS volleyball coach. Darren Utterback is out as the boys volleyball coach after completing his fourth season as both the indoor six-man coach and the sand program, the school’s athletic director confirmed. Utterback first joined the Breakers as JV coach in 2013 after a nearly 20-year history at Capistrano Valley. His JV squad went 21-1 capturing the major OC Championships to cap the season. In 2014 he took over the varsity team taking the Breakers to the Division 2 CIF finals in his first season following that with back-to-back State CIF Regional titles in 2014 and 2015. Last year the Breakers jumped to Division 1 and responded with an emotional win over Trinity League champion Mater Dei in the playoffs and a narrow 5-set loss to eventual champion Corona del Mar in the quarterfinals. His overall record indoors was 67-18 including 40-0 in league play and 11-4 in post-season play. 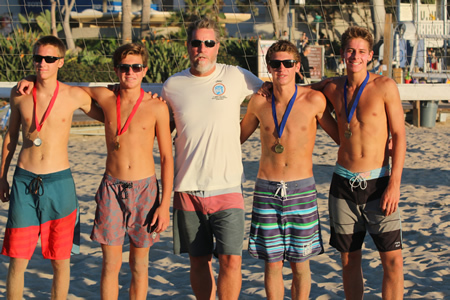 On the sand, Laguna went 29-6 in four seasons making the finals all four years with one title. The official reason given for Utterback’s departure is that he resigned, according to Athletic Director Lance Neal. This story was updated Nov. 21.